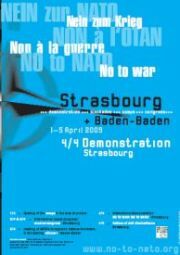 On April the 4, 2009, heads of states and governments will meet to celebrate NATO's 60th anniversary in Strasbourg and Baden-Baden at the German-French border. To address and counter the NATO summit, national and international groups working for peace, human rights and social justice will come together to bring up NATO's war policies and question the very existence of the military alliance, as peaceful and just solutions to conflict cannot be found through military means. This international congress will analyze NATO politics and strategy as well as discuss alternatives to NATO. This shall serve the peace movement to prepare long term actions. This international protest against NATO will take place in a colorful, manifold, enormous and peaceful way. Initiatives, networks and activists from the peace and anti-war movement from several European countries carry different forms of action and expression to block access to the NATO summit. This village of resistance will be able to host up to 8000 people. Festivals, concerts, workshops and other kind of cultural events will take place throughout the week. For more information about the peace camp, click here. Several members of the Global Article 9 Campaign to Abolish War are part of the International Coordinating Committee " No to war - No to NATO". We encourage many of you to participate in the events, protest against NATO's military and nuclear policies, and carry the colors of the Global Article 9 Campaign by asserting our vision of a peaceful, just and sustainable world that does not rely on force. Visit the "No to War - No to NATO" website for information about the events, here. Contact the Global Article 9 Campaign to Abolish War's Secretariat to inquire how you can represent the campaign during the events at article-9@peaceboat.gr.jp. A year ago, a number of groups among the U.S. peace movement and the Asian-American community came together to build on the momentum of the Six Party Talks and call on the participating countries to freeze and reduce their military spending. This initiative, called the Pacific Freeze Campaign, not only aims to bring Asian issues into the U.S. peace movement and support peace efforts in Northeast Asia, but also to launch a campaign of global significance that addresses the dangerous escalation in global military expenditures. Indeed, together, the six countries (United States, Japan, China, Russia, South Korea, and North Korea) are responsible for nearly 65% of global military spending. Despite the talks for peace in Northeast Asia, they are also the fastest growing military powers in the world. A freeze on military spending is just a start. Reducing military budgets - as well as freezing arms exports and imports to the region, stopping the construction of new military bases, and halting the construction of new weapons systems - will also be critical components of a collective peace and security system for the region. Under the leadership of Foreign Policy in Focus, Institute for Policy Studies, peace groups in all six countries have been building their own Pacific Freeze campaigns and coalitions according to their own specific needs. The Global Article 9 Campaign to Abolish War has endorsed the Pacific Freeze Campaign and contributes to this important initiative by advocating for the preservation of the Japanese peace constitution and its national and regional significance, including its global impact of Article 9 in regards to human rights, disarmament, nuclear weapons abolition, conflict prevention, development, the environment, and other global issues. Indeed, in July 2005, the Global Partnership for the Prevention of Armed Conflict (GPPAC) declared, in its action agenda for North East Asia, that "Article 9 of the Japanese Constitution has been the foundation for collective security for the entire Asia Pacific region." Therefore, the Global Article 9 Campaign adds its voice the Pacific Freeze Campaign's call that the hundreds of billions of dollars spent on preparing for war must urgently redirected towards improving the lives and welfare of millions of people in order to achieve human security in the region and globally. Read the Pacific Freeze's Call to Action, here. Visit the Pacific Freeze Campaign's website, here. From February 27 - March 2, more than 200 activists, scholars, and students from the United States and eleven other nations gathered at the national organizing conference of the Project on Military Bases held at the American University in Washington, D.C.
Made of 17 U.S. organizations, the Project on Military Bases aims at strengthening and integrating networks of organizations working for the closure and withdrawal of foreign military bases, as well as at developing common strategies that address the destructive impacts of U.S. military bases in the U.S. and abroad. Indeed, while the exact number of US bases is unknown, the Pentagon has a global network of over 1000 bases overseas (in addition to those in the U.S.), with 268 in Germany; 124 in Japan; 87 in South Korea; 89 in Italy; 57 in the Britain to cite just a few. Insisting on the unprecedented scale of U.S. foreign military presence, a number of participants from so-called "host" countries spoke of the negative impact that US bases have on their communities, including violence against women, environmental contamination, health consequences and violations of human rights. They described how discontent with the presence and impact of U.S. military bases on their soil has inspired citizens to run campaigns for their closure. The delegate from Ecuador shared how for years, human rights and peace groups lobbied against the base in Manta and eventually succeeded in having a ban on all foreign military presence included in the new Ecuadorian constitution. Movements are also active in Guam, Italy, Korea, Okinawa, Porto Rico, and beyond. Beyond working for the closure of specific bases, or all of them for that matter, participants underlined that military installations are the manifestation of a militarized state of the world, thus militarism itself must be addressed and challenged. As keynote speaker Phyllis Bennis from the Institute for Policy Studies encouraged in her final address, the issue of military bases is closely connected to many other major issues -from the environment and energy policy to torture, violence against women, war profiteering, and affordable housing. So, to address the issue of bases, we must reach out and connect with activists in other movements and make the fight against militarism a cross-cutting issue. In addition to plenary sessions and workshops, the conference comprised strategy sessions, a vigil in front of the Pentagon, a lobbying day and cultural events such as an anti-military fashion show. This article is based on the initial report from the conference, that can be found here. For information on the Project on Military Bases, visit its website here. After months of debate, Japan has dispatched two naval ships in waters off the coast of Somalia to join multinational operations against piracy. According to opponents, sending Japanese Maritime Self Defense Forces as part of the anti-piracy mission is yet another step paving the way for more SDF missions overseas and challenging the country's peace constitution. Indeed, while resisting US requests to send troops to Afghanistan, the government has taken a number of controversial steps. In addition to sending non-combat troops to Iraq from 2004 to 2008 and to refueling US vessels in the Indian Ocean as part of the so-called war on terror, Tokyo has sent two destroyers the Sea of Japan to monitor North Korean missile activity and developed a multi-billion dollar ballistic missile system with the US against a potential attack by North Korea. Japan's military is slowly moving away from its traditional self-defense role within its own borders, by redefining "national defense" to allow troops to be sent abroad for new types of operations, mostly characterized as policing activities. The bill approved by the government on March 13 authorizes the SDF to use weapons as part of the anti-piracy mission, in contradiction with Japan's pacific constitution that renounces the use of force and the deployment of forces abroad. Critics claim that invoking Article 82 of the Self-Defense Forces Law is a distorted application of the text that clearly states that the purpose of the SDF is to "deal with outside armed attacks", thus limiting their deployment in waters near Japan. Moreover, the bill authorizing the mission is unconstitutional, as it allows the SDF to use force for protecting foreign vessels. The fact that the government and the opposition have jointly agreed to define Japan's SDF responsibilities as a more frontline role in this mission indicates that major political parties both believe the country should take a higher-profile role on the world stage. Most of Japanese civil society does not share such political ambition, however, and many worry that this is the latest attempt to re-interpret and move away from the original meaning of Article 9 of Japan's peace constitution.